The dandelion (Taraxacum officinale) is much more than a weed — it is a healthful salad green and important herbal medicine. As a food, dandelion should be included at the dinner table. Bitter greens such as dandelion help the stomach in digestion by increasing bile production. It’s a good spring habit to add handfuls of wild leaves to meals a few times a day, if possible. Dandelions grow almost everywhere and are easy to find. In early spring when the weather is cool and moist, the rapidly growing leaves are tender for eating raw. Harvest the leaves with garden shears or by hand and gently clean them in the kitchen. Leaves are best when picked in the early morning. Its nutrition, versatility, and abundance makes dandelion such an amazing plant medicine that it never ceases to amaze me why homeowners everywhere don’t allow the dandelion to take over the lawn. It truly is a wildly free medicinal! As an herbal medicine, the dandelion flowers, leaves, and roots are useful to support digestion, the lymphatic system, and healthy urinary tract function. It is a perfect medicine that’s readily available and easy to find. Dandelion root is a helpful metabolic tonic for the digestive system, where it helps digestion and absorption of minerals. Roast the root and prepare it in a tea or tincture to include as part of a digestive herbal blend. Dandelion root tea has an affinity for the urinary tract system and can be included as part of a protocol to support healthy urinary function when mixed with other plants such as cranberry and echinacea. As a lymphatic herb, dandelion flowers can be used in a topical oil to massage over cystic and fibrous tissues. I like to use a dandelion flower oil massage to bring sunshine and vibrancy to tissues that may be stagnant and stuck, particularly the lymphatic breast and pectoral tissues below the armpits and the tender lymphatic tissues along the leg and groin regions. Dandelion flower–infused oil works well with infused oils of calendula, plantain, and violet flowers and leaves. This gentle herb-infused oil is helpful for Maya abdominal massage (a well-known technique developed by naturopath Rosita Arvigo, based on her apprenticeship with Mayan healer Don Elijio Panti), and for massage for postpartum mothers. In midspring, as the weather warms, pluck the flowers easily with your fingers. Because they are difficult to wash well, harvest flowers that are free from significant dust and debris. Dandelions that grow in the shade will be more tender and sweet than those growing in direct sun. They will also bloom later. Leaves become significantly more bitter, dry, and rough after the dandelion goes to flower and seed and as the weather becomes warm in summer. Dig the roots any time across the seasons. The soil quality and moisture determine whether the roots will be easy or difficult to remove. Use a hand-digging tool, and be careful not to break off the taproot midway. Both the crowns and roots will need a good brushing and scrubbing in the kitchen to remove excess soil. Interested in learning more about medicinal plants? 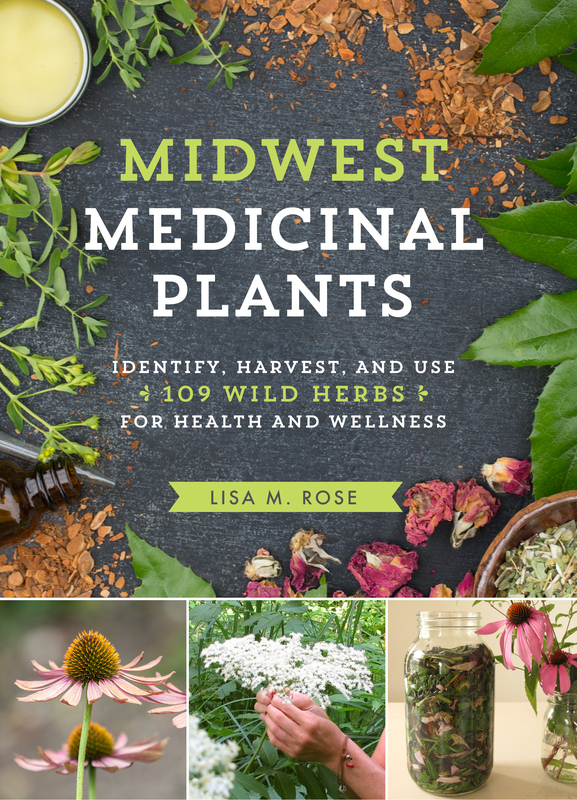 PreOrder my next book, “Midwest Medicinal Plants” on Amazon.com today!